21 year old Rohan Felmingham from Brisbane in Australia rode his motorcycle 30,000 klm across Russia and Europe only to have it stolen on arrival in Dublin last week. The bike, a Yamaha Tenere, was loaded with all of Rohan’s possessions and was stolen last Tuesday while he was sorting out his accommodation having just arrived in the capital. This is the third such incident where long distance motorcycle tourers have had their machines stolen in Dublin. 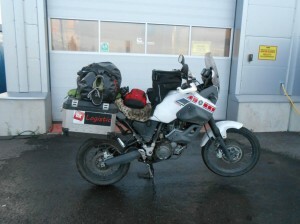 In August of last year, American Noah Horak had his KTM 690 stolen in very similar circumstances. Rohan is about as far away from home as he could possibly be and was left with just the bike gear he was standing in, his helmet and his rucksack containing his travel documents and laptop. When word of this appalling theft got out, members from the Irish section of the UKGSer motorcycle forum met with Rohan and began to offer assistance and support by sourcing accommodation and clothing as well as trying to publicise his situation. Gardai are currently searching for Rohan’s motorcycle and MAG Ireland understands that members of various biking forums are actively looking out for the missing Yamaha. If you know the whereabouts of this motorcycle, please contact Pearse Street Garda Station, 01 666 9000. LAST SEEN: The corner of Aston Quay and O’Connell Bridge, Dublin, between 5pm and 9pm on Tuesday 19th November 2013. DISTINGUISHING FEATURES: (scratches/dents etc. ): Japanese number plate, bent clutch and brake levers, scratched windshield with white numbers painted on, quite dented panniers. This post will be updated with further information as and when we receive it.